The 10/1 shot had several horses in front of him jumping the last but jockey Sam Twiston-Davies conjured up an amazing finish from the five-year-old to collar last year's winner on the line and post a head success. Trainer Paul Nicholls was visibly delighted following the race and Caid Du Berlais' success saw both trainer and jockey record a 92.5/1 double on the day following Sam Winner's victory earlier in the Murphy Group Handicap Chase. "We were in two minds whether to run given his performance on soft ground last season!" said Nicholls. "I'm obviously glad we did now and I said to Sam before the race not to forget that he'd won on soft at Auteuil earlier on in his career. "Sam's given him a lovely ride. The plan was always to follow Johns Spirit, come wide and pounce late and it's come off perfectly. "He's run well here before as well so we know he likes the track. I'm delighted for Sam and delighted for the team at home as well. Megan (Nicholls' daughter) leads him round and Harry (Nicholls' nephew) looks after him at home so it's a real team effort. "Sam is improving all the time. He doesn't panic and has done exactly what we asked him to. "The plan was very much about today - this was his Gold Cup. We'll see where we go from here but I'm just happy it all came together today. "I've not been worried about the stable form earlier this year. This is when you want them to come right - not in October. Most of the horses I've been running weren't entitled to win anyway." Twiston-Davies was also wreathed in smiles following the race and explained that the horse had done exactly what was asked of him. "It's amazing - this is what this job is all about," said the jockey. "It's a great team at Paul's and I'm happy to be riding big winners for him. The plan was to follow Johns Spirit and pounce late and although we were a bit further back at the last than I'd hoped, he's picked up well and flown up the hill. "He's still only young and maybe there's a bit more to come from him." 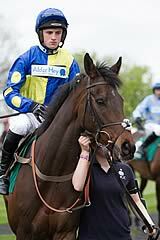 Johns Spirit made a most gallant attempt to become the sixth horse to win two Paddy Power Gold Cups. Twelve months after beating Colour Squadron three-quarters of a length in the Grade Three contest, he went under by just a head to Caid Du Berlais, caught in the final strides carrying 24lb more. His trainer Jonjo O'Neill was as much a gentleman in defeat as he is in victory. "The weight beat him," he said of the 8/1 shot, "but we're absolutely thrilled with him. He wasn't in front too soon or anything like that, it was a great ride, a great run, it was just the weight. "Yes, it is a bit hard to lose like that, caught so close to the line. But that's Cheltenham, that's the hill, and what makes it so exciting." Johns Spirits' rider Richie McLernon was, obviously, gutted to lose so close to home. "He's run a blinder," was all he could say. The 5/1 favourite Present View finished third, with the softened ground thwarting his bid. "He is such an exuberant, flamboyant jumper," said trainer Jamie Snowden, "and the ground just caught him out, simple as that. It blunted his natural spring. 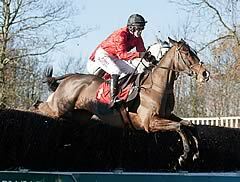 But he's such a lovely horse and we're very proud of him." Fourth-placed Oscar Whisky, the joint top-weight, will be back at Cheltenham for The Festival, with a Grade One prize his target. The nine-year-old was doing his best work at the finish under Barry Geraghty on his first run of the season, a neck behind Present View. "Barry says go for the Ryanair Chase," said trainer Nicky Henderson, "and now all we need to do is plan how to get there. He'll certainly come on for this run." Barry Geraghty was delighted with joint top-weight Oscar Whisky's fourth on his seasonal debut. He commented about the Nicky Henderson-trained Cheltenham specialist: "I was pleased with him and he may come back here in a month's time (for the £100,000 December Gold Cup on Saturday, December 13). "Oscar Whisky is in good shape. He ticked all the right boxes today - all yeses, no noes." Paul Moloney, rider of the fifth home Buywise who stayed on well in the straight, said: "He ran a good race - it was just the mistakes that cost him and he was not good enough on the day. "There were a couple of costly mistakes and this was as good a race as he has ever run in. Match practice is everything and you have got to take all those things into account. "I am obviously disappointed but he has not been beaten far and he has run well - a positive run." 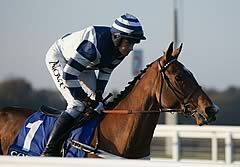 Davy Russell partnered the sixth home, Irish raider Shanpallas. First staged in 1960, the Grade Three Paddy Power Gold Cup is one of Jump racing’s most illustrious and valuable handicap chases and its history is replete with the names of some of the sport’s finest horses. The initial incarnation of the race produced a mighty winner in the Tom Dreaper-trained Fortria. Ridden by Pat Taaffe, the eight-year-old Irish raider carried top-weight of 12st to victory in what was then an extended two-mile contest staged under its original title of the Mackeson Gold Cup. The race was sponsored under the Mackeson banner until it became the Murphys Gold Cup in 1996. In 2000, Thomas Pink was unveiled as the sponsor until leading bookmaker Paddy Power took over in 2003.